Murray Lord at Wellington Yacht Partners tells me he and Steve Doyle at Northrop & Johnson have taken over the listings for sale of the sailing yachts Aiyana and her sistership Two. The 24.6m _Aiyana_ is the first in a series, built by Alia Yachts in 2010 to a design by Warwick Yacht Design with composite engineering by High Modulus. Aiyana features generous accommodation for six guests in three staterooms and a fourth convertible cabin provides room for two additional guests or crew. Other features of Aiyana include a large pilothouse saloon, an exquisite mahogany interior and a hydraulic lifting keel. 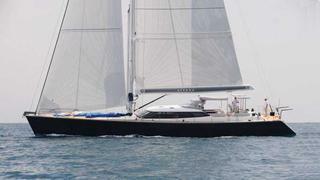 Aiyana is asking $5.45 million. Her sistership, Two, is now available for inspection in La Ciotat, France. As with Aiyana, the construction of Two in 2011 was project managed by a very experienced Australian project manager and a British Captain with extensive Maxi Yacht racing experience. Accommodating eight guests in four cabins, Two is asking $5.95 million.